The NICU is probably unlike anything you’ve experienced before. The unit is often busy, with lots of activity, people moving about, and monitors beeping. The NICU staff uses the monitors to continuously track your baby’s vital signs (heart rate, temperature, breathing rate and blood pressure). Infant monitors are very sensitive and detect even subtle changes in your baby’s condition. Sometimes monitors will alarm when nothing is really wrong with the baby’s condition (“false alarms”). To ensure that your baby’s condition stays “on track,” the doctors will order various tests, including periodic blood and urine tests, X-rays, and ultrasounds. The NICU staff will explain what the monitors, tubes, tests, and machines mean. This should help make you more comfortable in the NICU. You will probably find your baby sleeping most of the time, especially in the beginning. In fact, most newborns sleep almost twenty hours a day. As your baby’s health improves and she spends more time awake, we encourage you to interact with her more and more. The nurses will help you handle your baby and learn to recognize his limits. As you get to know your baby, you will become familiar with his sleep patterns and preferences. With time, the staff will rely on you to tell us about your baby’s daily progress. Family-Centered Care: We believe that families should be intimately involved in their newborn’s care. We have designed our NICU spaces to be welcoming to families in order to encourage you to spend time in the unit with your baby. You and your baby are the most important part of our team. We’d like you to participate with our NICU staff in making your baby’s “developmental care plan.” Your contribution will help us to tailor your baby’s care to her needs. We also encourage parents to take part in patient rounds, which is the time each day when the neonatal team discusses your baby’s condition and reassesses the plan of care. Families are defined by you and may include individuals who are not related by blood or marriage. Each family member is an individual, entitled to recognition and consideration. Changes in the physical or emotional health of one family member affect other family members. Members of different families within the NICU can benefit from one another’s support. Breast Feeding/Lactation: We strongly encourage mothers to breastfeed their infants. Breastfeeding is an opportunity to bond with your baby. It also offers many nutritional benefits to the infant. If your baby is ill or very small, she will not be able to nurse and may not be fed at all. In those circumstances we recommend that you pump, freeze, and save your breast milk until your baby becomes stronger. The NICU nurses will help you with breast feeding, will advise you about electric pumps, and may put you in touch with a lactation consultant. Kangaroo Care: As soon as your baby’s condition allows, we encourage skin-to-skin contact between you and your baby. This type of bonding, called Kangaroo Care, is achieved when a mother (or father) holds a diapered baby in an upright position on their bare chest, and covers the baby with a shirt or blanket. This simple technique enhances the physical and emotional connection between you and your baby. Some parents tell us Kangaroo Care makes them feel closer and more relaxed in caring for their baby. It may even increase a mother’s milk supply and improve a baby’s weight gain. As soon as your baby is stable enough we will encourage you to kangaroo. 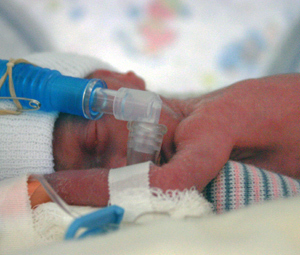 Many premature babies attain these milestones approximately 2 – 4 weeks before their original ‘due date,’ but some babies may need to remain in the NICU longer. That is particularly true for babies born more than twelve weeks early (<28 weeks gestation). What should I do to prepare for discharge? Get to know your baby and feel comfortable caring for him or her. Become informed about your baby’s care. Learn ways to soothe or settle your baby. Learn to change your baby’s diaper and clothes. Feed your baby as often as possible. Learn to bathe your baby. Understand how to administer all medications and treatments needed by your baby at home. Learn to position your baby in the car seat. Select a pediatrician for your baby and schedule your baby’s first appointment. If your baby is a boy, decide if you would like him to be circumcised. It should be scheduled about one week prior to discharge if possible. Inquire about immunizations, and get a record of any that were administered during your baby’s NICU stay. Learn infant CPR. The NICU secretary can help you schedule a class before your baby goes home. If your baby is going home on an apnea monitor, complete monitor training and get a list of important contact numbers. If your infant is going home on oxygen, become familiar with the equipment, learn to secure the nasal cannula, and get a list of important contact numbers. Provide us with your contact information so we can keep you informed of upcoming NICU events, including the Annual NICU Graduate Reunion. Ask for a copy of your baby’s Discharge Summary. Bring it with you on your baby’s first visit to the pediatrician.